Healthy: Get active. Maybe you’ve been sitting all day. Or holding yourself in one position. Or performing a repetitive action for hours. After work, it’s time to shake things up and get mobile! It doesn’t need to be full-on CrossFit or a marathon. Devote a few minutes to stretch, take the dog for a walk, or water the garden. Unhealthy: Holding on to stress. Be aware if you’re about to get behind the wheel of a car and you’re tense, just take a minute in the parking lot to transition into the next part of your day. Sit and take some deep breaths, read a light article on your phone, or grab a bubble tea or smoothie and watch passers-by from a park bench before heading home. Healthy: Mark the transition. When you get home, take a minute to reset. Get changed out of your office clothes or dusty coveralls right away and put on your comfy clothes. If you need to get out of your head, do something brief and relaxing, like playing a video game or taking the kids to the park, or commenting on some of your friends’ Instagram photos. Put your feet up for a few minutes, have a glass of water, then start your evening. Unhealthy: Ranting as you walk in the door. Ranting about work not only ruins your evening, but the evening for those around you too. Take a moment before you walk in the door to remind yourself how you want to behave with your family. 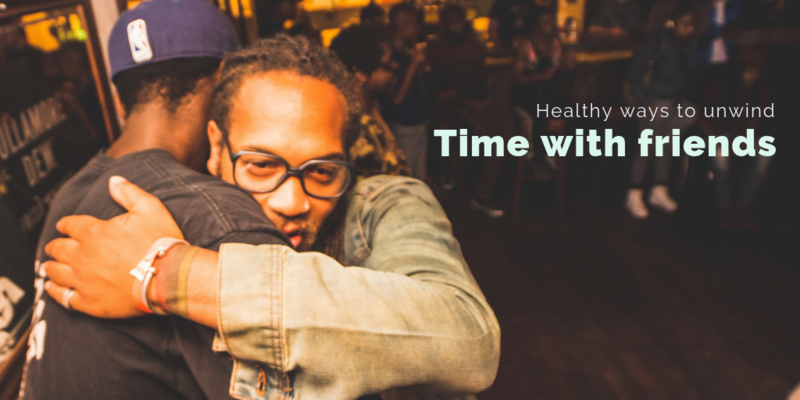 Healthy: Time with friends. If you’ve had a tough day, see if you can meet some friends afterward. It will give you something to look forward to. Hanging out with a friend over coffee helps you get out of your stressed-out headspace. An outside-of-work friend can give you some needed perspective, even if you don’t talk about your workday troubles at all. Unhealthy: Fixating on the little things. We tend to get caught up in our own minds and can get fixated on that one turning point in our day when a challenge became aggravation. Don’t replay it over and over. Set the thought of it aside for now. Healthy: Have a good meal. Maybe you haven’t had time to eat well on the job, and it was all go-go-go. You ate at your desk again. Why not make your favourite food when you get home? Fresh tacos, anyone? Stop at the grocery store and get some fresh ingredients. 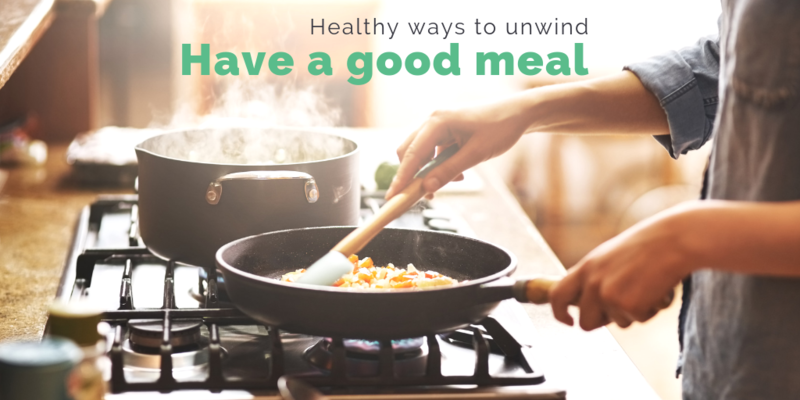 You’ll have an activity to look forward to when you get home, and a nourishing meal. Unhealthy: Emotional eating. On a stressful day, maybe you didn’t get a real break, and when you get home feeling all hungry, you’re tempted to just munch on a bag of chips. Or, you reach for an alcoholic drink. Movies and internet memes alike reinforce the “I need a stiff drink” behaviour after a hard day. A moderate drink while out with friends, or savouring a glass of wine can be fine, but make sure you’re not using it as a coping mechanism for stress. 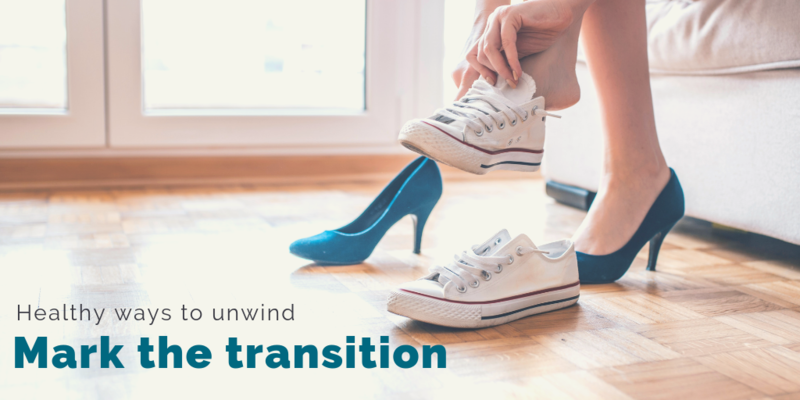 Don’t overwhelm yourself by trying to change too much all at once. 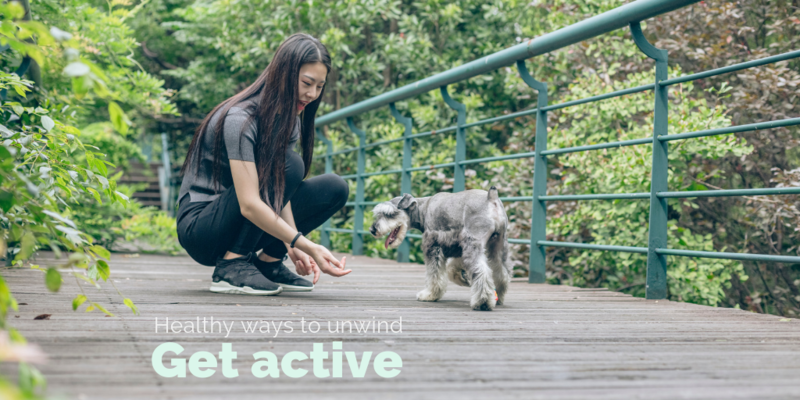 Even if you only pick one unhealthy behaviour from this list to let go, and one healthy behaviour to pick up, you’ll make progress in enjoying your downtime and leaving workday stress behind.